I have always loved avocado and grilled shrimp together. A tartine is an opened face sandwich in French. Here, La Tartine Gourmande makes a tartine for lunch, by smearing (or in my world, "schmearing") toasts with an avocado mash and pairing them with grilled shrimp. It makes the perfect crostini appetizer, or a special lunch. Mash the avocado with the cilantro, cayenne, lime juice, red onion and kosher salt. Set aside. In a grill pan, heat olive oil and shake cumin over the shrimp. Add the garlic and shrimp to the pan and cook 2 minutes on each side. Slice each shrimp in half. Toast the bread and drizzle with the olive oil that you used to grill the shrimp with from the grill pan (yes, that's what I said). 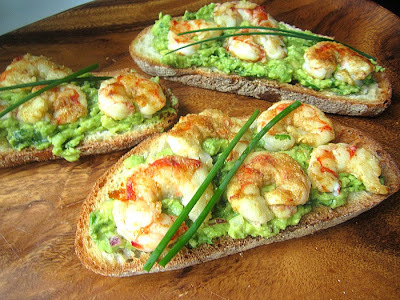 Schmear the toasts w/ the avocado mash and top with 4 shrimp halves each. Garnish w/ fresh snipped chives and enjoy warm. 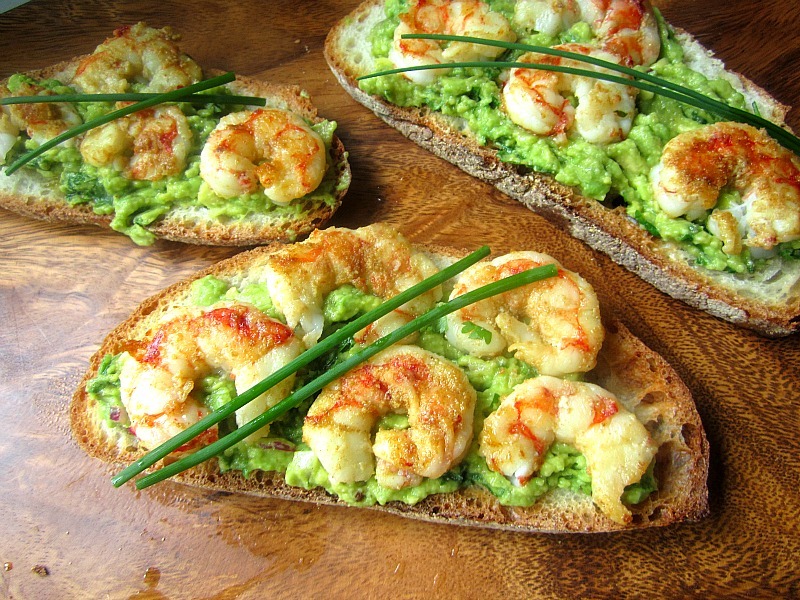 Avocado and shrimp are the ultimate sandwich toppings. I love them together in a salad but never thought to top slices of grilled bread with the combo. Your photo is making me hungry. One of the things I miss most about living in Paris is the abundance of resturants that serve these perfect open faced sandwiches. Tartines Rule! That looks so darn good!! I frequently eat avocado smeared on toast for breakfast or lunch, but this shrimp on top would be even better (well, maybe not for breakfast). And it's pretty too. Oh yum, I've adopted your practice of eating avocado for breakfast but this pairing would work too. Making your swiss chard tart tonight for supper.